This month's Deep Dive meeting brings together thought leaders in Cybercrime, Security, and Privacy to discover new technologies, network, and exchange insight. 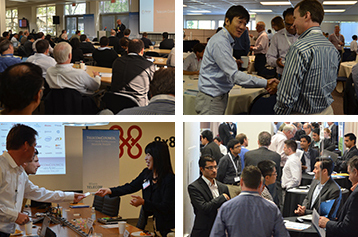 In true Telecom Council style, our Deep Dives are short, packed, interactive discussions with top-notch networking. Although there have been worse times for freedom and surveillance, there has never been a time with more different vectors, threats, and technologies that can all pose a risk to our personal right to privacy. We are faced with constant malicious attacks from nations, stateless movements, criminals, and our own governments. And our beloved connectivity has eliminated the geographical separation which used to be a firewall. The threat vectors never sleep, never rest, and take no holidays. Truly, no data, and nobody is safe. Yes, it is awful. Faced with this kind of onslaught, it's not clear how we can best protect ourselves, our customers, our corporate data, trade secrets, and our money. Being scared into inaction is a natural reaction, and sadly is the path taken by many websites, retailers, and the US Office of Personnel Management. But what are the right measures to take? The Telecom Council avoids discussing Privacy in-depth at most of our meetings, because it usually is a conversation-stopper for most of the innovations we love – think about it, many innovations are built on personalization and knowing the user better. Most of what we do has positive benefits, but also risk to Privacy. But not today. Today, let's not shirk the responsibility to face the threats. Let's discuss best measures to take to measure the threat, counter the threat, protect the data of our users, and protect our businesses. We'll hear from speakers expert in these areas, startups with solutions, and from contributions from all those in attendance.